This is a writing activity for contemplating the coming year. Divide the page into 3 columns. Label the far left column “Probably Not.” Label the right-hand column “Probably.” Leave the middle column blank. On the right, list things that will probably occur in the coming year. On the left, list things that probably will not happen. For the middle column, think about all that is uncertain. What you hope for. How surprises can change everything. What you don’t know yet. Think about the whole 365 days of the year, all the seasons. What can they possibly bring? 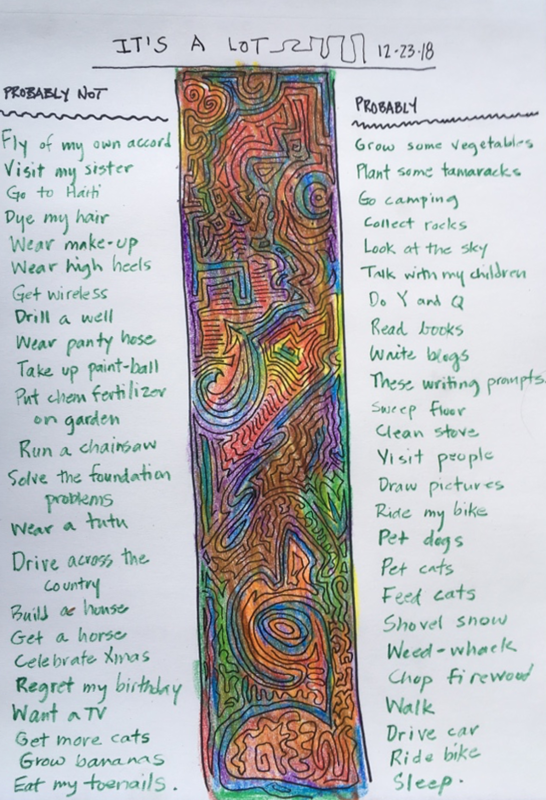 While you are daydreaming about these things, doodle in the middle column. Just doodle. 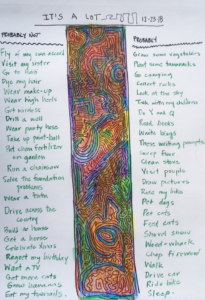 Daydream aimlessly and doodle aimlessly until the middle column is full. Then daydream and doodle a little bit more. When you have finished, give your work a title. Put the date on it as well.